Can it sell itself as well as it parks itself? 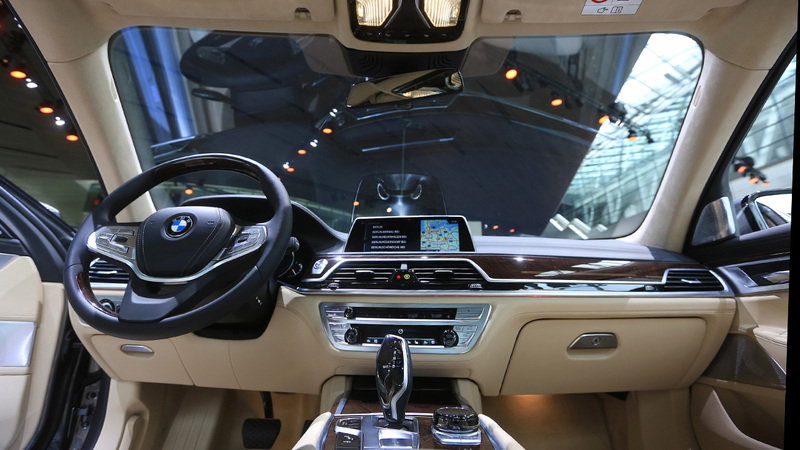 COLOGNE, Germany—BMW showed off its gadget-stuffed new 7 series, which enters the automotive market in the next month, at a packed event at the Dmexco conference. Filled with high-tech features that would make James Bond envious—such as a key fob that can park your car remotely and doubles as fuel gauge—the BMW line is also undergoing a shift in how it's marketed (though it has no plans to abandon its "Ultimate Driving Machine" tagline). "We want to stay true to ourselves, but also to take our marketing to another stage," said Timo Resch, BMW's vp of product management for the Grand series, in his introduction. Resch launched into an explanation of all manner of bells and whistles that have gone into the new 7 series, including in-car gesture controls of volume and phone calls, a removable tablet in the backseat, lighter and more environamentally efficient carbon fiber technology, and the aforementioned key fob. "Our main goal of all this technology is to make it easy to use," continued Resch. "You won't need to read the owner's manual to use the key fob [if you're already familiar with handheld technology]. Also, we will follow up with owners about four weeks after they take the car home, to answer questions and guide them through some areas they may not be familiar with." BMW's marketing approach took a more subtle turn to promote the technology. The German car company contacted about 25,000 consumers globally—a blend of BMW customers, customers of other cars and non-car owners—then grouped them into batches of 10-20 to show them the car. Though they weren't allowed to have any mobile devices with them at the time of the demo (i.e. no photos or videos), they were encouraged to generate social buzz by sharing their early experiences. Other marketing tweaks Resch discussed include advertising that plays up different elements depending on the region. For instance, in China the ads emphasize the 7 series' lavish and roomy interior where the U.S. ads will play up the power of the 8-cylinder engine. But with so many controls in the car that allow for less actual driving, how will BMW preserve its "Ultimate Driving Machine" tagline? Resch's slightly curvy answer: "We have to be the car that offers all these driving aids. … But as soon as you have a curvy mountain road ahead of you, then you can take over and get that distinctive feel." So how much will the new 7 series cost its' high-end consumers? Somewhere in the mid $70,000s. It will be available in the U.S. around Thanksgiving.